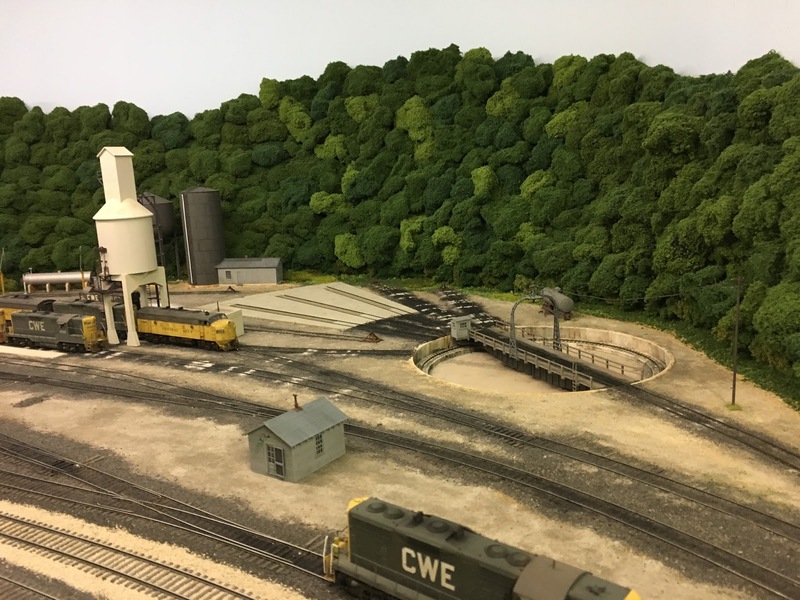 Last fall, work began in earnest on the ballast and track in the roundhouse area at North Pierce. There was one primary catalyst for this and it was a picture taken by Neil Schofield of the engine terminal on his CP Rail Vermont Lines. I believe the photo appeared on the MRH Forum at some point and it's shown below. 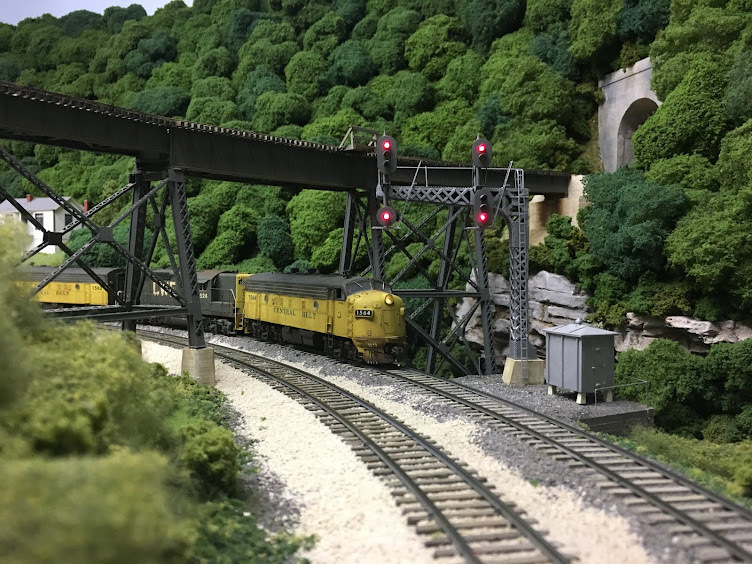 Neil does incredibly beautiful work and you can find a number of wonderful videos of his railroad on YouTube. But what caught my eye in this photo was the ballast. Note the fine texture and the colors- absolutely typical of what you would have found at just about any engine terminal in the 1970's. And it occurred to me that you could achieve this look using tile grout and some paint. So I thought I'd give it a try. I have an old piece of Homasote with ties and rail on it that I used to develop the sand colors that are used on the grade heading up the hill from Big Chimney. It could serve as the perfect test bed for the new ballast. The photo below shows the results. The ballast is grey grout and I used black poster paint to represent spilled oil and grease. I was pleased enough with the results that I decided to forge ahead. But first, the radial tracks needed some attention. Feeders had to be run to the rails and then routed through the new panel so that power could be turned on and off. And I had never re-programmed the NYRS PT Model III controller after the radial tracks were installed. So some work was required to make everything operational before the ballast was put down. The photo below shows the panel for the engine terminal with the on/off track power toggles along with the new instructions for operating the turntable. Once the mechanicals were all in order, ballasting began. I used grey tile grout along with a 50/50 mix of grey and white grout. I applied the grout with a plastic spoon and then went back over it to smooth it out. I applied the sand in various areas and concentrated a bit of it around where the sanding tower will eventually be. An application of 70% isopropyl alcohol followed by a 2:1 mix of wet water and white glue followed and fixed everything in place. The photos below show the area once these steps were complete. The grease and oil was added using black poster paint. 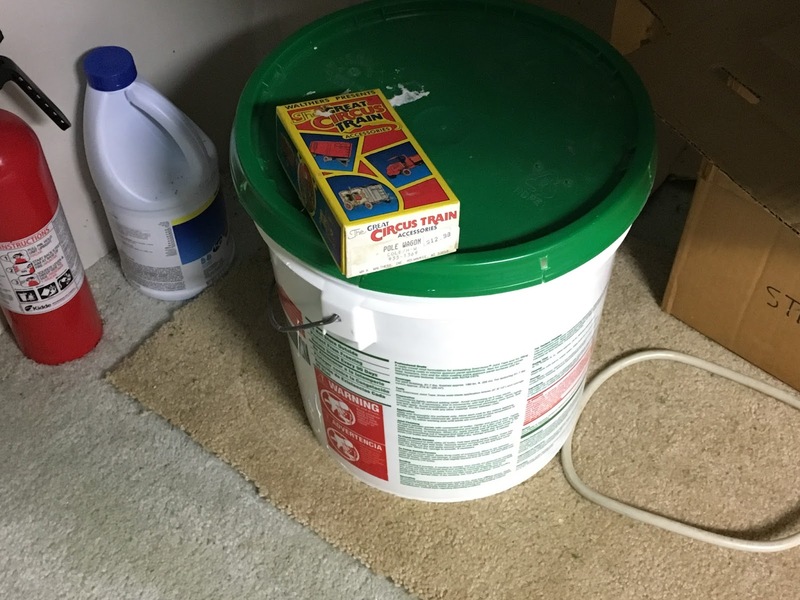 This paint is water soluble and can be used straight out of the container or thinned to get various washes. As I was working on the ballast, I started thinking about the roundhouse again. I purchased the Walthers three stall engine house many years with the thought of incorporating it in the engine terminal at North Pierce. As can be seen in the photo above, the base was installed when the radial tracks were laid. So I had to either use the kit, scratch-build something to fit the base, or leave just the foundation. 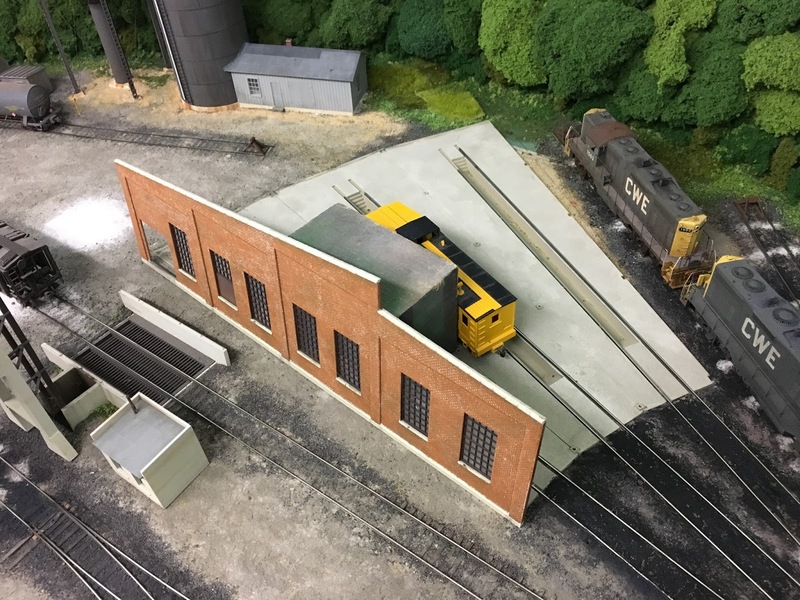 I was tempted to just leave the foundation as there were many instances in the 1970's of roundhouses being torn down while the tracks remained in service. But there was another photo that had been working on me, and it was driving me toward using the roundhouse. 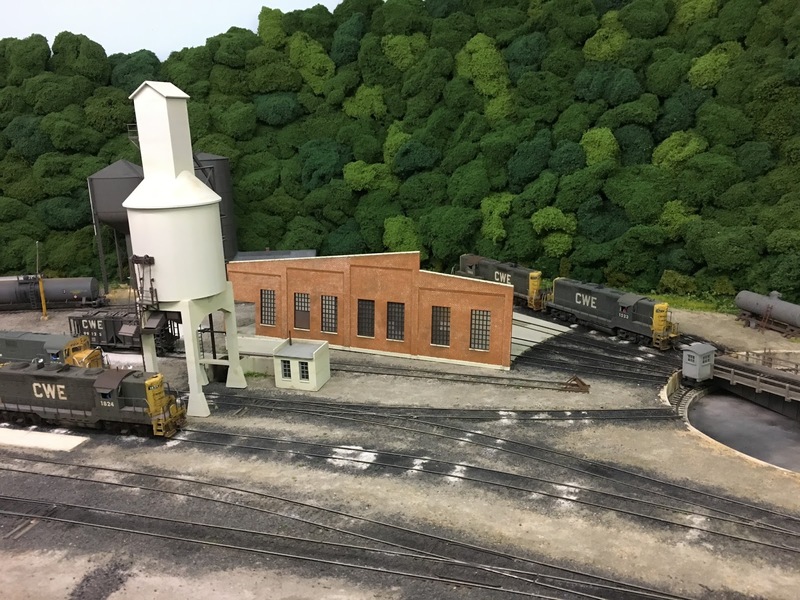 There are a number of photos of the various structures in the engine terminal at Hinton, WV on the C&O that were taken by Bill Simonson. His website contains a wealth of information about this location along with many scale drawings of the various structures. The photo that captured my attention, however, can be found here: http://hinton.cohs.org/photos/image0078.JPG. I printed this picture out on a piece of 8 1/2 x 11 paper and kept it on my desk for several months. I began to think that I might be able to capture the essence of the colors and came up with some ideas about how to achieve them. In Part 2, I'll describe the trial and error process in detail. Bill purchased these originally from Mike Burgett whose company, Control Train Components, manufactures and distributes a wide array of CTC panel parts. Here's a link to his website: http://www.ctcparts.com/. 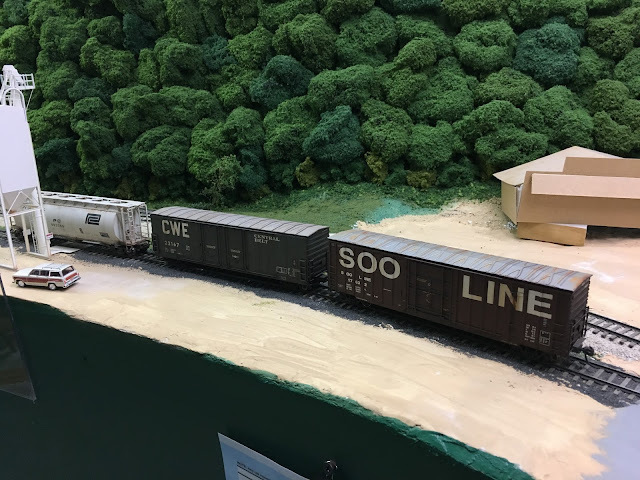 Mike is also the owner of the museum quality C&O's 1965 Alleghany and James River Subdivisions layout. 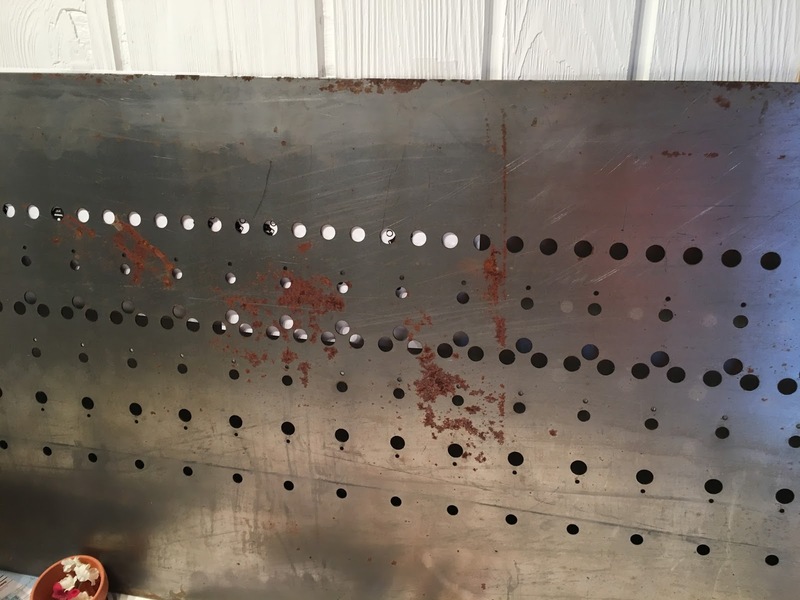 The panel has a small amount of surface rust which will need to be cleaned up prior to painting. And it will need a primer coat before the US&S green is applied. Fortunately for me, another good friend specializes in metal work. 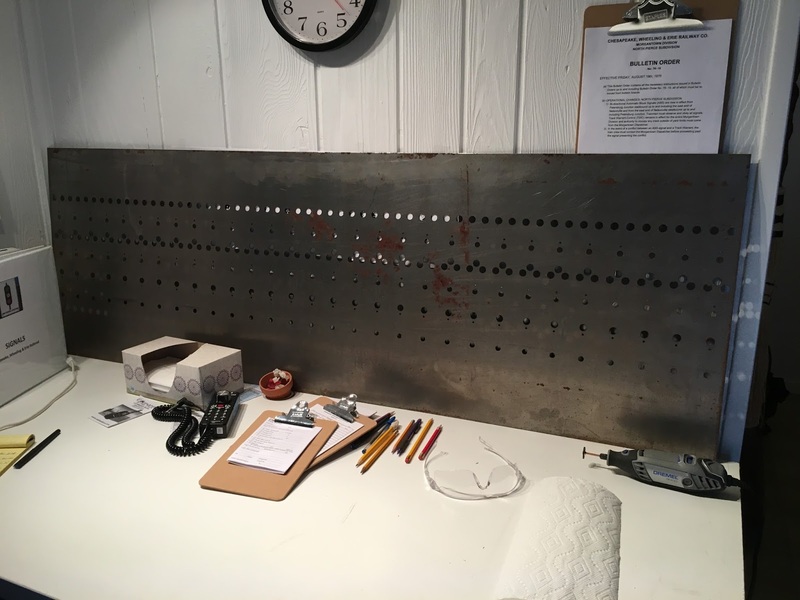 Randy Seiler has agreed to clean, trim and paint the panel for me in exchange for a hand-laid curved turnout (or two, as I found out last night) on his B&O/PC West layout. You can see his track plan and follow his progress on his blog on the MRH Forum. Here's a link: http://model-railroad-hobbyist.com/node/17997. The close-up photo below shows the surface rust. The daunting task of acquiring all of the necessary hardware now looms before me. 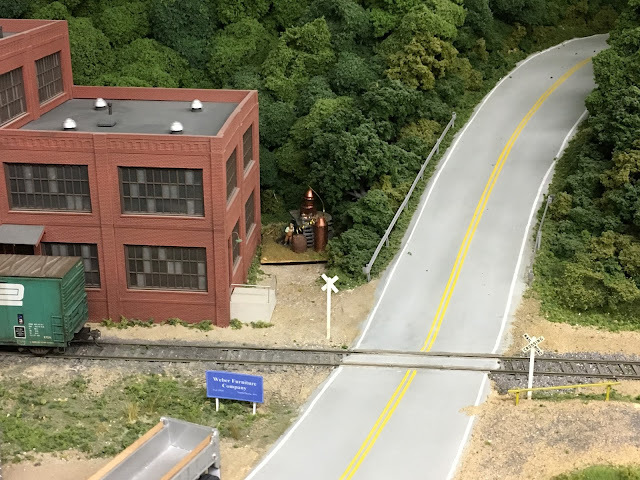 Fortunately, several local modelers have built similar US&S panels and have offered up a number of different suppliers for the various switches and LED's. An initial order has been placed with Rail Logic Technologies in order to test fit a number of their parts. And Bill Ford has also done some research on possible sources. So onward! The next step will be to design and build the track diagram along with the cabinet. Stay tuned! Just prior to the last operating session, a number of us were in the kitchen enjoying a hot cup of coffee. I happened to notice a small box in the pocket of John Miller's sweatshirt when he arrived. I mentioned to him that I saw the box and he replied that he had brought something for someone else or some such excuse. A likely story, as anyone who knows John will attest. After the session, I found the box stashed under the layout- see the photo below. Of course, the box was empty. Which meant that whatever had arrived in it had either been given to someone else (highly unlikely!) or had been deposited somewhere on the railroad. I took a quick look around and didn't spot anything amiss. As with previous rascal adventures, I knew the unwanted contribution would show itself at some point in time. On the Sunday following the session, I decided to continue work on the roundhouse. The photo below shows how it looked during the session. The roundhouse wall was propped up against a block of wood in order to show the crews how the structure would eventually look. As I climbed up on a small step ladder to remove the wall, I found what appears in the photo below. Found! 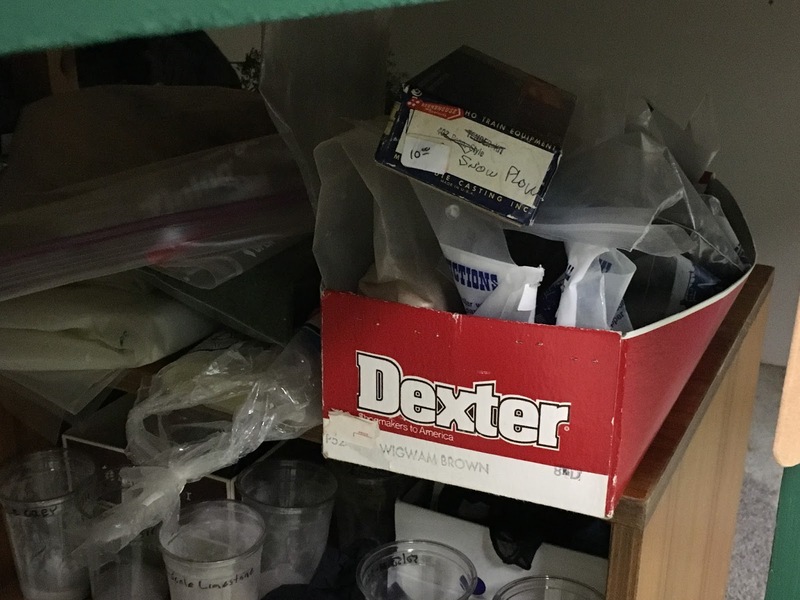 I now was confident that I had found the wayward deposit that had arrived in the box that Miller brought. And I was feeling pretty good about finding it so quickly. 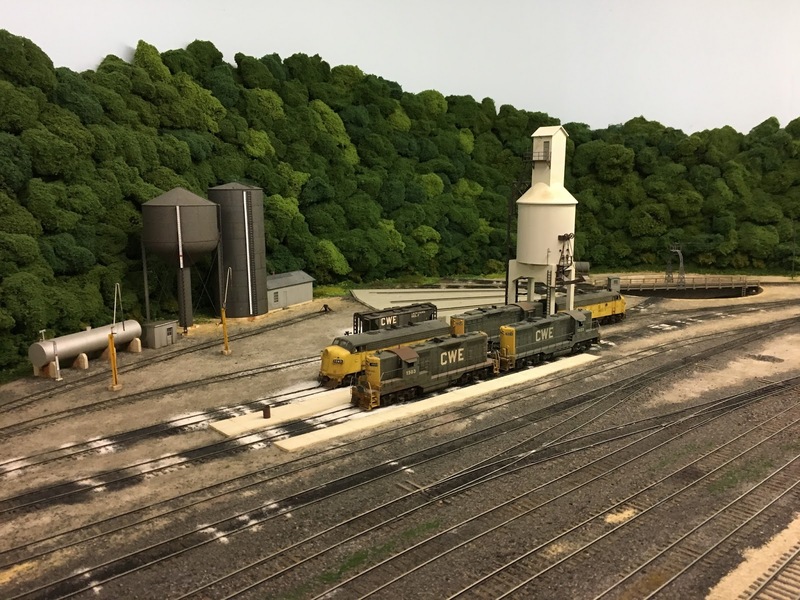 I also knew that Matt Snell, who had been yardmaster at North Pierce for the session, had been in on the shenanigans as no one could have placed the snow plow in the roundhouse without his noticing it. So mystery solved and culprits identified. Or so I thought. A quick explanation of the snow plow- I had to reschedule the session due to a snow storm that blew into town. So the rascals thought that a snow plow would prevent that from happening in the future. The Monday after the op session, I attended a work session on John Miller's Kanawha & Lake Erie Railroad. The usual participants are John, Bill Doll and me. The usual workers are Bill and me. I told John that I had found the plow and he and Bill both claimed they had nothing to do with it. They said it had been solely the work of Matt Snell. Needless to say, I was disappointed. Up until this point, Matt had been one of the most reliable members of the crew and someone whom I would have least expected to join the rascals. Oh well. John also claimed that he had planned to do something but couldn't find a level spot on the railroad. He mumbled something about the "damned hills in Appalachia." The implication of his comment was that he had been unsuccessful in whatever mischief he had wanted to create. What stuck in my mind, though, was the fact that the box he brought was left in the train room and was empty. Later in the week, I found the box that appears in the photo below stashed under the layout. This is clearly how the snowplow arrived on the scene. And of course this meant that whatever arrived in John's box was still somewhere on the railroad. Last night, I was re-staging the loader on the Weber Furniture spur in North Pierce. As I looked down the track toward Weber Furniture, I spotted was appears in the photo below. After the last operating session, I walked around the railroad to check things out. The photo below shows what I found at Logan, WV. 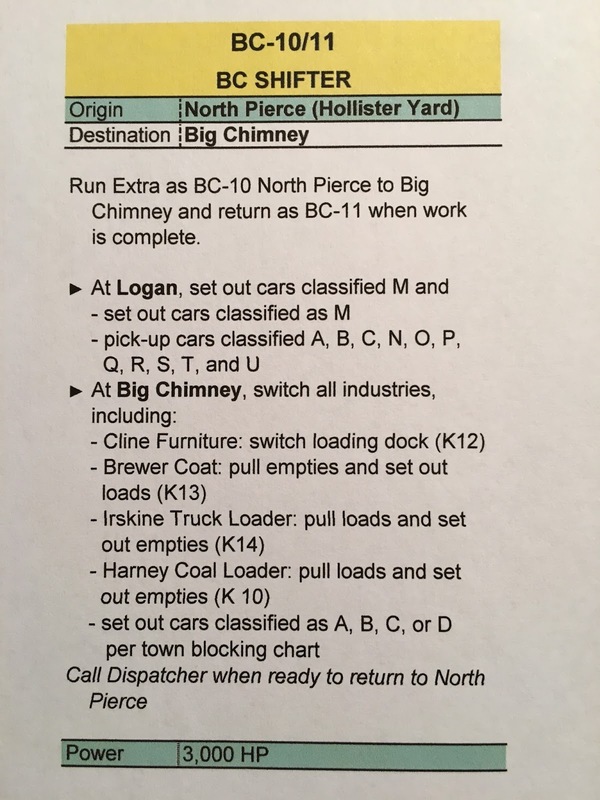 The PC covered hopper car and the SOO boxcar were spotted on the team track by the crew of BC-10/11 which works Logan before heading east to Big Chimney. 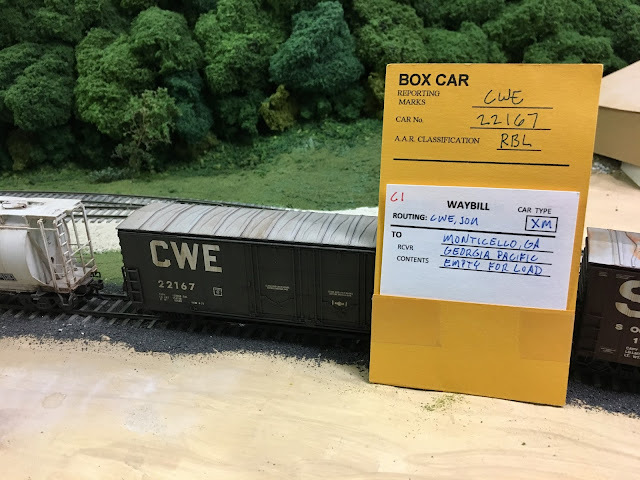 The CWE boxcar was already there when BC-10/11 arrived and was supposed to be picked up. 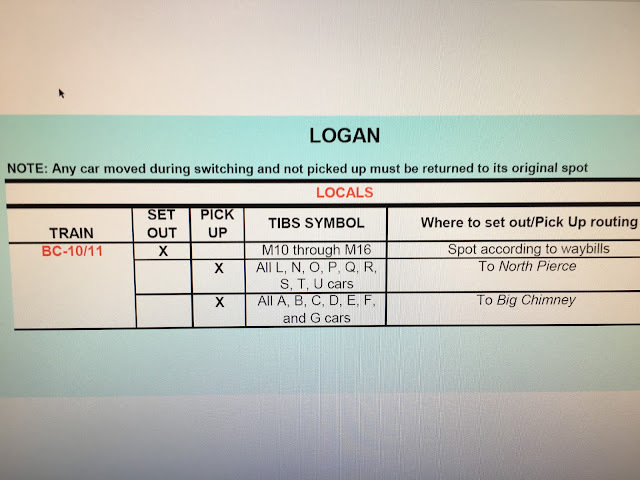 As can be seen on the car card below, the boxcar is headed to Monticello, GA and has a TIBS symbol of C1. This is the second op session in a row that this car wasn't picked up. So I checked the town chart shown below. The town chart clearly shows that BC-10/11 should pick up any cars with a TIBS symbol of A through G and take them to Big Chimney. So clearly the crews weren't reading the town charts. 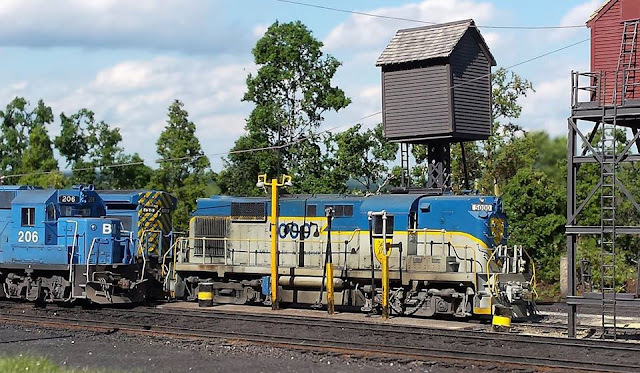 However, the regular operators are all very experienced and have run the railroad many times before. So there must be something that is telling the crews not to pick up these cars. A quick check of the train card revealed the problem- there was no reference to making any pick-ups at Logan. So the train card for BC-10/11 has been revised as shown below. Hopefully, this change will get CWE 22167 back on the road. And it's a good thing that I checked the documentation before calling out the crews. The crow sandwich that would have resulted from that mistake would have tasted awful!